Falcyyr Film Update - See Sandra, Douwe, and Rovandio in the trailer video! It has been over a year since we did our last filming days for Falcyyr. This past year (2015) was spent editing the massive amounts of footage that director Ahura Z. Diliiza and his crew took. He has decided to create a tv series instead of a movie so that he can start showing the footage he already has. I have seen pieces of the first episode and the scenes with the horses look fantastic! You can see short snippets of us in this trailer video. I will have more updates soon! Please like the Falcyyr Facebook page to stay updated and show your support. Thanks! Behind the Scenes on Falcyyr: Working in the Rain! As the winter weather approaches it is becoming more difficult to finish the scenes for the film. Ahura Diliiza, the director, needed a scene with my character Artemis and his character Thor. Both of our characters are training the Valkyrie in the film. It was a short scene that we did last Saturday but hard to do because of the weather. It was very cold and rainy. My costume is not exactly meant for cold weather either!!! After an entire day of preparation (makeup/hair starting at 10:30 in the morning) we only fit in about a half hour of filming before it was too dark and rainy outside. Such is the nature of filming!! Here are a few photos taken by Sinari Diliiza. Click here to follow Falcyyr on Facebook. Behind the Scenes of Falcyyr: The Ride of the Valkyries! left to right: Myself, Kaylee Clark, Lydia Spencer, and Elisha Harvey wearing our costumes for the first time. Photo taken by Unicovia Pictures. I love this photo of Rovandio getting tacked up for filming. His tack was made by Lisa Oberman of El Sueno Espanol. Photo taken by Unicovia Pictures. Filming a scene like this takes hours of preparation. The film crew arrived at my house around 10:30 AM and we were ready to head over to the barn around 1:00 PM. I had bathed Rovandio in the morning while Lydia Rose Spencer and Kaylee Clarke schooled their horses. Elisha Harvey trailered her horse, Thor, over to Isaac Royal Farm around 10:00 AM. We were each playing stunt doubles for the other actresses so most of the shots would avoid close-ups of our faces. Lydia had wigs from the Isaac Royal Equestrian Theater for her and Kaylee's characters that have black hair. I was playing Sinari Diliiza's character as Brunhilda, head of the Valkyrie. She is the main character in the movie. I chose to ride Rovandio because he is more reliable and manageable than Douwe in open fields, galloping with other horses. Lydia Rose on Zeppelin, leading the way up the pine trail. Photo taken by Unicovia Pictures. It was damp and chilly when we took the horses out to the woods and Elisha's horse Thor was quite hyper! He is normally a very lazy horse, but today he was ready to go and not fond of the repetitive walking scenes. We started by walking down the trail past the cameras many, many times so they could film the horses from multiple angles. It was great for the other horses to start out slowly and work our way up to the galloping scene. We did some trotting shots and also cantering our favorite trail we call "the Pines". This field is on my property and is picturesque with planted pine trees all around the slightly uphill trail. The leaves were covering the ground so it was still beautiful even though the trees were a little sparse from all the rain and wind we had last week. The director, Ahura, had us stay side by side, starting from a halt, then a few steps walk, trot and away we went! The horses were well-behaved, though Lydia's Friesian mount, Zeppelin, through in a buck. It is hard to see us but this shot shows us galloping by Ahura as he films the close-ups. Photo credit: Unicovia Pictures. After the horses were done with the galloping scene he needed to get close-ups of the real actresses on the horses for their lines. It was interesting to watch the horses' reactions...when Ahura would say, "Action" they would stand perfectly still and almost hold their breath! It only took a few tries to get the scene the way he wanted it. Awesome photo of Sinari Diliiza on Rovandio. She was the actress that I played stunt rider for in the galloping scene. Photo credit: Unicovia Pictures. The horses were very patient and seemed content to much on grass in between takes. It was a lot of fun and I think everyone enjoyed it! I have been traveling to Standish, ME for filming just about every week so far this summer. Each session we work on a new scene and recently that has included some night scenes. The director, Ahura Diliiza, created a scene where my character (Artemis, Goddess of the Hunt) leads an initiation and celebration for the four main characters. We all had to learn a Gaia chant in a made up language along with dance choreography. Ahura composed the music/chant and it has a great beat to dance to. It took about 3 weeks of practice to perfect it as a group. We had some issues with the weather and a thunderstorm forced us to work inside with a green screen on one occassion. Here are some beautiful photographs during practice and filming courtesy of Unicovia Pictures. We just finished our last night scene for now and will be moving onto the next portion involving the other characters Thor and Athena. In between takes...we have a little too much fun! There will be plenty of footage for the blooper reel! Photo courtesy of Unicovia Pictures. Kazi fixes my makeup between takes. Every once in awhile I rub my chin and the design smudges....ahhh! Photo courtesy of Unicovia Pictures. Kazi taught us the choreography for the Gaia chant, here she is leading the group. And yes she is wearing one of my tee shirt! :) Photo courtesy of Unicovia Pictures. Action shot during the Gaia chant dance. Not a flattering pose but at least you can see that we were really moving! :) Photo courtesy of Unicovia Pictures. I wanted to give everyone an update on the film FALCYYR that Douwe and I will be acting in this summer. Right now the director Ahura Z. Diliiza is working on my costume for my part as Artemis, Goddess of the Hunt. I bought a beautiful new corset and he is adding some armor to it as well as improving upon my bow, arrows, quiver and bracer from the film Essential Realism that we did last fall. I am also excited to announce that Lisa Oberman of El Sueno Espanol is making a custom bitless bridle and breastcollar for us to use in the film. Lisa made the beautiful bridle and breastcollar that I used in Essential Realism for Douwe, click here to see photos from that film shoot. The new set will be made of brown leather with gold medallions to match my new costume. I am also getting a custom pair of breeches from the fabulous Sonya Bergstrom of Aanstadt-Das Breeches. She is making something really special for me, I can't wait to show you photos when they arrive! Please check out her breeches on Etsy, click here. Filming will begin in a few weeks for me and then the scenes with the horses will be later in the summer. My new steampunk style corset. He will be adding some armor-like pieces and other details so I am more of a warrior goddess. My newly improved bracers, quiver, arrows, bow and headdress. Director Ahura Z. Diliiza putting the final touches on my new bow. Handmade piece from one of the Valkyrie costumes. Sandra & Douwe Cast in a new Film, FALCYYR! I am excited to announce that Douwe and I have been cast in another Maine film called FALCYYR. My character is Artemis, Goddess of the Hunt. Filming will begin this May in Standish, ME. I met the director, Ahura Diliiza on the set of Frost Bite, a film directed by Alan Dillingham. I was cast as a news reporter in a scene with Ahura, in which he played one of the main characters. Douwe will also be in some of the scenes that will be filmed during the summer months. 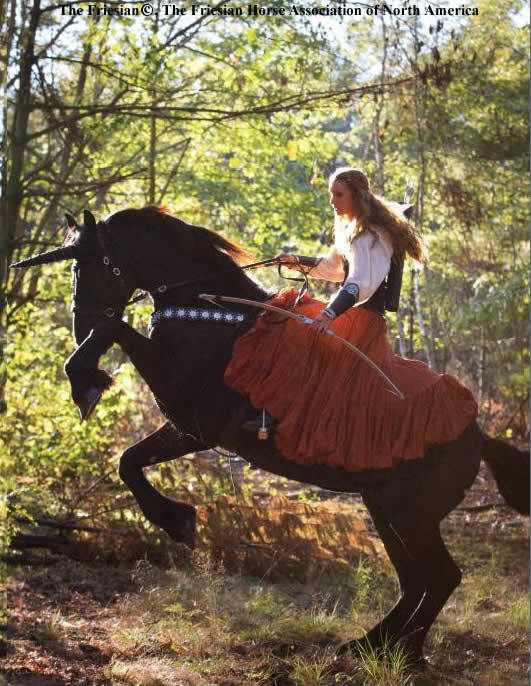 I am looking forward to practicing my acting skills, learning some sword fighting, wearing some great costumes and of course...riding my beautiful horse in another film! Five women are chosen by the Fates at the request of Odin (the Great All-Father of the Nordic gods) to be trained, empowered and transformed into legendary beings known as Valkyrie. These four women are chosen from different time periods and backgrounds as the gods are not limited by time and space. Each of them are plucked moments before the time of their demise and given a choice to serve Asgard and therefore the world of Earth, or be placed back within the grasp of oblivion. Once transformed they will save the earth from an aggressive alien race that views humanity as a source of food. The director Ahura, shown in the photo, will be playing Thor the God of Thunder in this film. They have done some filing over the past few years and hope to finish by fall of this year, 2014.